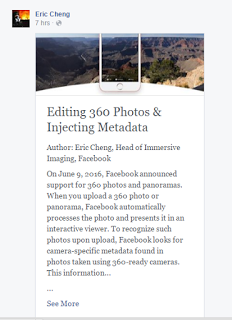 Facebook’s Head of Immersive Imaging, Eric Cheng, posted a detailed article about editing and uploading photos to Facebook. Facebook recognizes 360-degree photos based on the EXIF metadata. Specifically, it looks at the Make and Model. 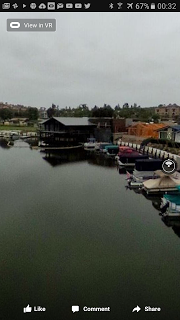 If the Make and Model correspond to a known 360-degree camera, it will present it as a 360-degree image. Some editing programs can strip the metadata. Facebook recommends the exiftool program to reinsert the correct metadata, which allows batch processing (editing a group of files instead of having to edit each file individually). If you stitched the image yourself or used an unrecognized camera, you can still get the photo recognized as a 360-degree image by using the exiftool. Just change the Make and Model to make it look like a known 360-degree camera such as the Ricoh Theta S. (Make: RICOH Model: RICOH THETA S). To clone out the tripod, you need to rotate the image -90 degrees latitude shift using Flexify, which puts the “bottom” of the image in the middle, where it can be easily edited. After editing, you can restore the image orientation by rotating the image +90 degrees. To edit the seam, you need to rotate the image 180 degrees longitudinally (again, using Flexify or a similar tool). You can also rotate the image longitudinally to control what the viewer sees first. 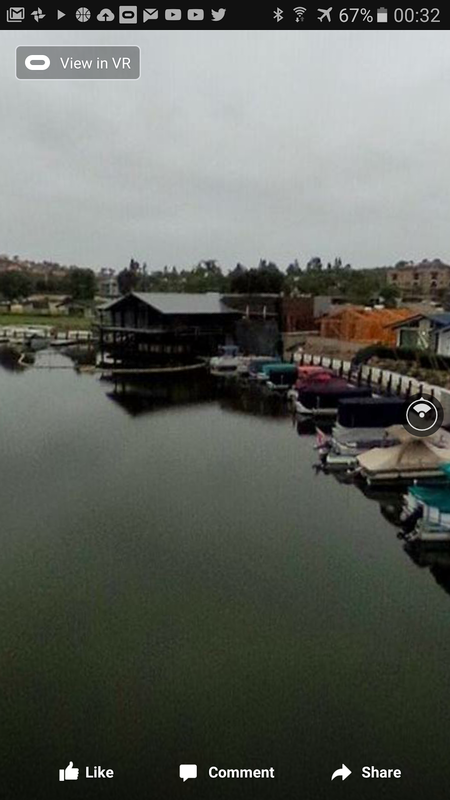 Facebook will show the middle of the equirectangular image first. I had difficulty viewing and posting 360-degree photos. A member of the Facebook 360 Community suggested dragging a photo into a post (instead of clicking on “Add Photo”), which worked (first you have to click on the empty post, then drag a 360-photo into the empty post). If you have Samsung Gear VR, there will be an option to view the 360 photo in VR, which makes sense because Facebook owns Oculus, which powers the Samsung Gear VR.